The Fairchild Hiller FH-1100 is a single-engine, single two-bladed rotor, light helicopter which began as a design entry into United States Army's Light Observation Helicopter program. 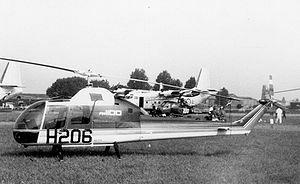 The Hiller Model 1100 was not selected but after Hiller Aircraft was purchased by Fairchild Stratos in 1964, the Model 1100 was successful marketed as a civilian helicopter, the FH-1100. The type certificate is now held by the FH1100 Manufacturing Corporation of Century, Florida. In October 1960, the Army submitted a request for proposals (RFP) for the Light Observation Helicopter (LOH). Hiller Aircraft (Hiller), along with 12 other manufacturers, including Bell Helicopter (Bell) and Hughes Tool Co. Aircraft Division (Hughes), entered the competition, submitting their designs to a Navy team for evaluation. Hiller submitted the Model 1100, which was recommended by the Navy team and eventually selected as one of three winners of the design competition by the Army in May 1961. The Army designated the Model 1100 design as the YHO-5. Detailed design work began in November 1961, and the Model 1100 prototype made its maiden flight on 21 January 1963. Hiller produced a total of 5 copies of the Model 1100 to submit to the Army for the Test and Evaluation phase at Camp Rucker, Alabama in 1963. 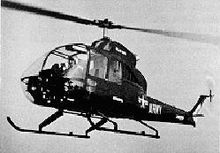 After the test and evaluation, the Bell YOH-4 was eliminated, and Hiller and Hughes competed in a program cost analysis bid for the contract. In 1965, Hiller was underbid by Hughes and the Army selected Hughes' YOH-6. Although Hiller formally protested, Hughes was awarded a production contract for the OH-6 Cayuse. In 1967, when the Army reopened the LOH competition for bids because Hughes Tool Co. Aircraft Division couldn't meet the contractual production demands. Fairchild-Hiller decided not to resubmit their bid with the YOH-5A, instead choosing to continue with commercial marketing of their civilian version, the FH-1100. The FH-1100 was produced until 1973. In 2000, the Type Certificate was purchased by FH1100 Manufacturing Corporation. FH1100 Manufacturing conducts remanufacturing and training but has not received a production certificate for the FH-1100, which it now calls the FHoenix. Hiller Model 1100 Four-seat prototype powered by a Allison 250-C10 engine and certified in May 1964. RH-1100A Pegasus Updated civil version, built and marketed by Rogerson Hiller Helicopters. RH-1100M Updated military version, built and marketed by Rogerson Hiller Helicopters. YOH-5A United States Army designations for five Model 1100 for evaluation powered by a 250shp Allison T-63-A-5 engine. An FH-1100 was on display at a Paris airshow in the early 1970s when it experienced what is believed to be a control link failure, leading to a loss of control, an in-flight break up and subsequent crash of the machine. Capacity: 860 lbs or 2-3 passengers. Munson, Kenneth (1969). Helicopters and other rotorcraft since 1907. New York: Macmillan. OCLC 218444. ISBN 0713706104. Apostolo, Giorgio (1984). The illustrated encyclopedia of helicopters. New York: Bonanza Books. ISBN 0517439352. Donald, David (1998). The complete encyclopedia of world aircraft. New York: Barnes & Noble Books. OCLC: 52598955. ISBN 0760705925. Taylor, John W.R. (ed.) (1971). Jane's All The World's Aircraft 1971-72. London: Jane's Yearbooks. ISBN 0 354 00094 2. Jackson, Paul; Lindsay T. Peacock, and Kenneth Munson (2004). Jane's all the world's aircraft, 2004-2005. Couldson, Surrey, UK: Jane's Information Group. ISBN 0710626142.